This is a piece I made for an upcoming art show at Bear and Bird Gallery in Lauderhill, FL. The show is curated by Heidi Kenney, so of course I was delighted when I got the email asking if I'd want to make something for it! If you find yourself in the area anytime from June 28th-August 10th, stop by Bear and Bird and say hello to Smokey for me! **Here are all the details on the show! 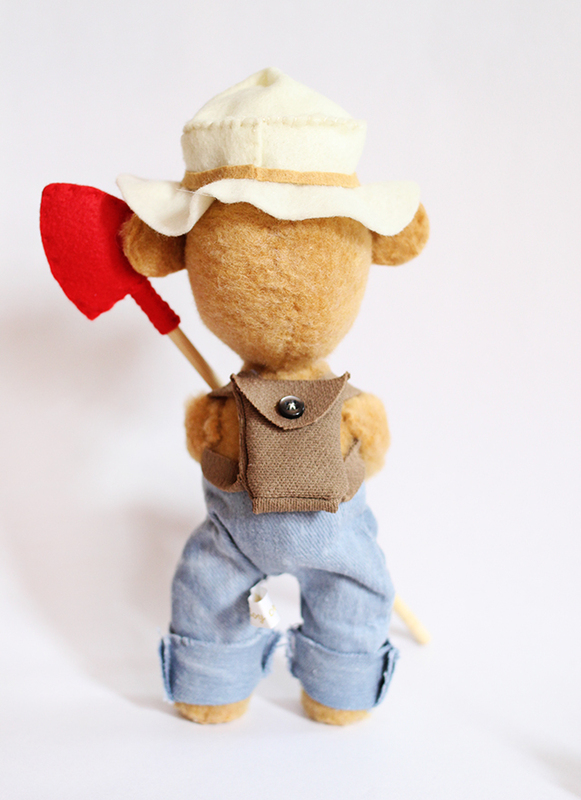 This is unbelievably cute, and so well made with the attention to detail! I love the little backpack. Wish I was close enough to visit him! This is so so so cute! It's perfect. You are so talented! I just adore all of your creations. I just love it! So many wonderful little details. and SO. CUTE! Oh gosh that is so adorable! So stinkin' cute! Amazing work. Ak! I love his droopy little button eyes! Homemade is so much more charming. This is so cool! I love the Bear and the Bird art gallery even, went there for my birthday a couple years ago. You've now given me a reason to head there in the next couple weeks for the show! Seriously, when I saw this on my Facebook feed, I was so excited! Will you be selling the piece? If so, I hope I can get there before someone else claims it. Truly, as a fan of the art gallery and your work, this is awesome. This little guy!! So cute! Amen to this. It's such a tough balance between staying home with kids and pursuing a passion/career. Love your blog and I'm continually inspired by it. 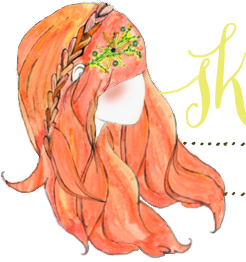 Found you via A Beautiful Mess - met Elsie years ago at a scrapbooking event. Been hooked ever since. 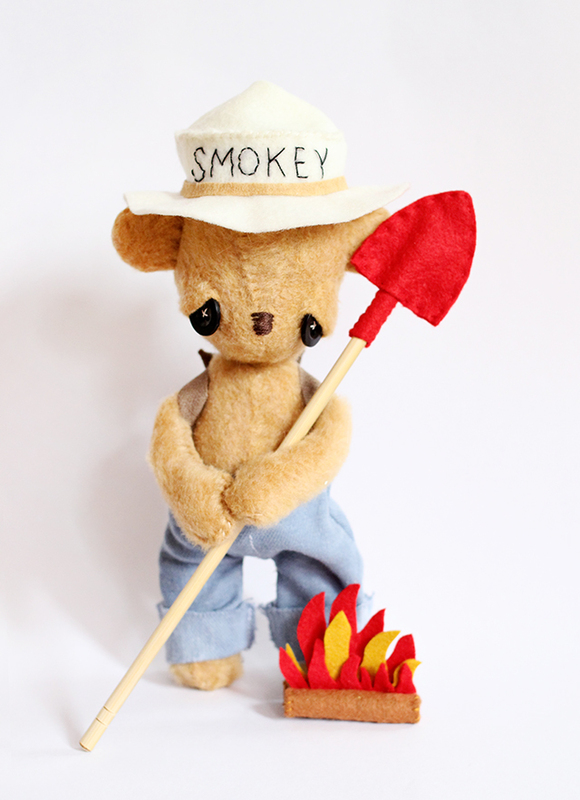 Love your little Smokey the Bear too - he's darling! He's adorable! Wish I live in the US! so much fun! Just want to snuggle with him! Oh so cute! 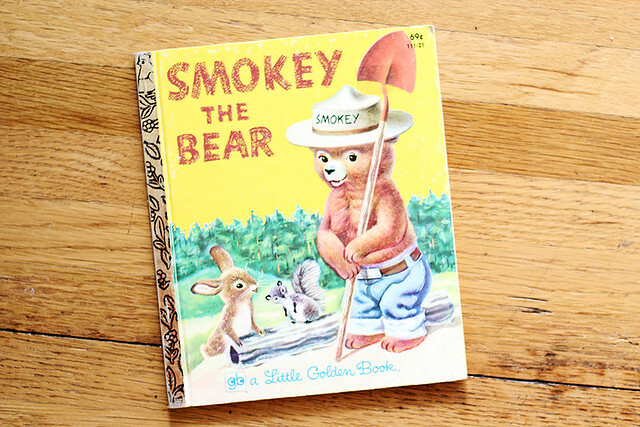 I sang the Smokey the Bear song all the time as a kid, so I am completely in love! Oh my goodness he is SO stinkin' CUTE!! This is so cute! You are really talented. Oh my god that is so amazing and adorable!! I love it!! Is it an art show that you could win an award for? Because you totally deserve one! It's just an art show to view really special pieces, but you are sweet as pie!! He's absolutely adorable. I love all the detail work you've done on him. Especially since he seems very true to both how he normally looks and your signature creation style. I'm kinda obsessed. Oh my, that bear is too cute! I love all of the little creatures you make. can't wait! ill be there! Oh my gosh, he is ADORABLE! I love his eyes! Oh man, this is so cute! 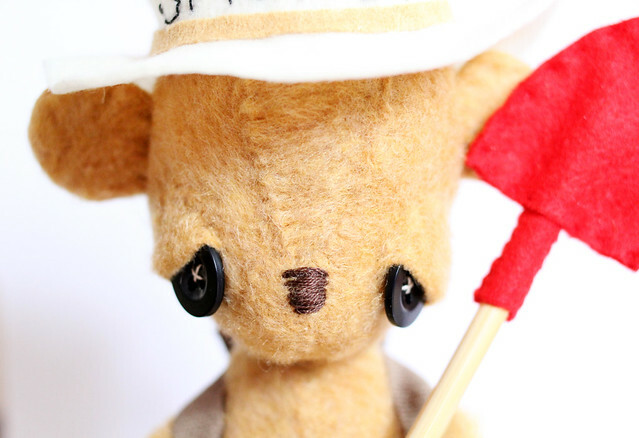 I love all of your little animals I've seen so far- it makes me want to learn to make my own stuffed animals! Did you take a class on it or did you teach yourself? oh goodness! he's just so so sweet! How amazing I love Tate's/Bear and Bird Gallery! i can't wait to go to the opening and say hello to Smokey! THIS IS AMAZING!!! 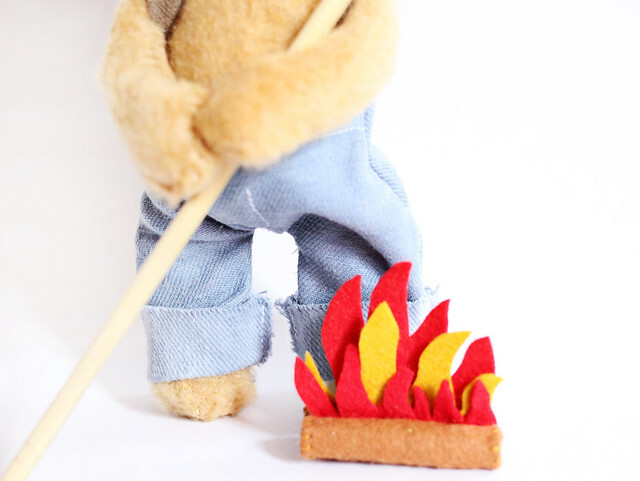 I am a fire Ranger in Ontario, Canada so smokey the bear is close to my heart! First, this completely made my day! 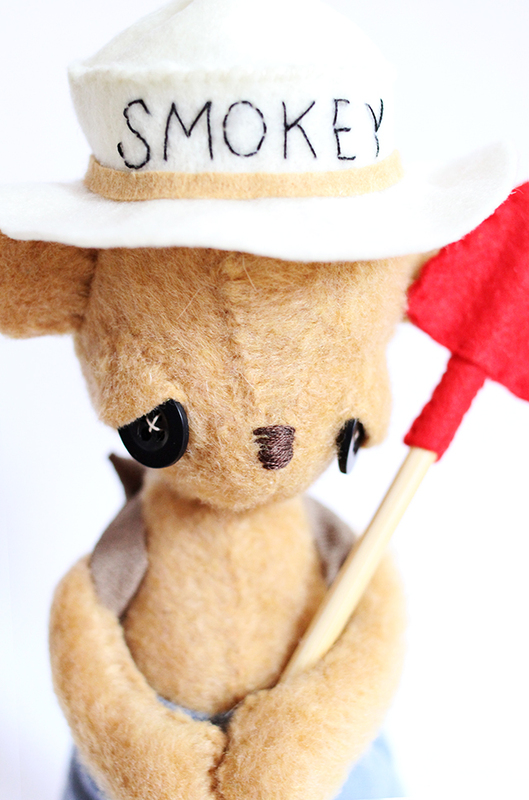 Second, This is BY FAR the most adorable smokey the bear I have ever seen! As a crafter, I can totally appreciate the love and amount of work that must have gone into this project and probably a super fun one too! Thanks for making my day! All of the dolls you make are stunning! Ahhh! So adorable! I want him!